This is always the male progenitor of a brood (known as a covey) of some dozen or so chicks who often is announcing their collective descent down the ridge to wreak havoc in our vegetable garden. All one needs to do then is saunter down the back steps to suddenly frighten them to death as they go up in a giant, dreadful whir of feathers and squawking, after which the male will scold at me from atop the biggest rock, his ego bruised. They are to me one of the strangest creatures I’ve ever come across. When you google them as a subject, you usually find sites generated by hunters in the ‘Lower 48’ who are on the prowl for ‘the illusive Chukar Partridge’ all decked out in camouflage. I’ve yet to hear of any hunters in our area on the prowl for them, but believe me, we’ve got Chukars and they ain’t illusive. Here’s another 2.5″ x 3″ art card–the same size as a baseball card. My experience with them is that watercolours simply have to have protection from the elements, so the only way I’ve ever sold ACEOs is matted and framed behind glass. I find 3″ x 3.5″ metal frames and cut mats to fit, and sell them that way. The notion that they are to be traded and sold in the same way baseball cards are is to fail to take into account how a miniature original watercolour needs to be treated in order to be acceptable for the buyer. IOW, they may be the same size, but they aren’t baseball cards, lol. 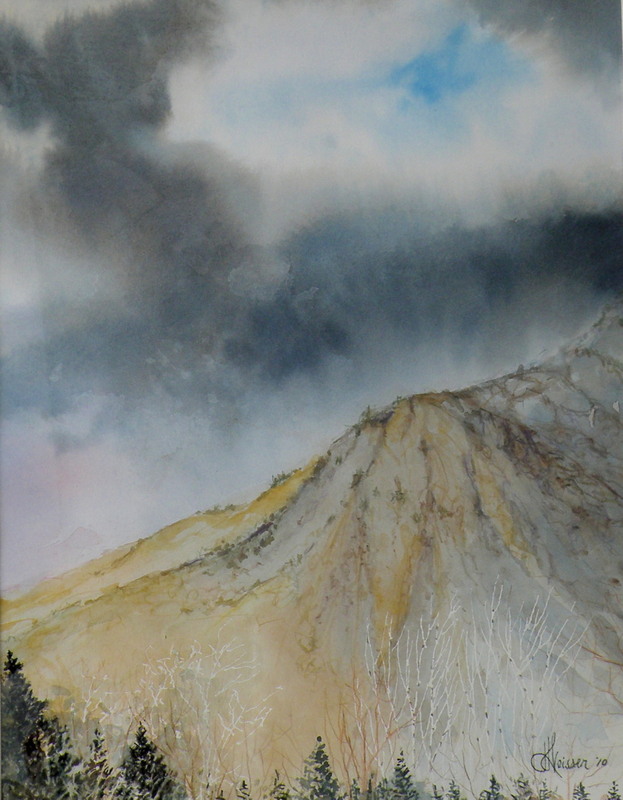 ‘Lone Pine’, watercolour by Lance Weisser, 2.5″ x 3″, Arches Hot Press 140 lb Paper, Sold. It is the most blessed of months heralding the muted pallet–the toned-down greens, beefed-up greys, complex browns, accents of burnt orange, titian–trees simply/complexly themselves, displaying their line, frost-kissed leaves flashing their last colour, refusing dismissal. Wonderous November--leaf-whipping, mini-cyclones, clouds suddenly letting forth face-lashing first flakes on towards frost-spongy earth–days framed by late mornings and early evenings, one’s home truly one’s castle, warming against the elements. Showboats gone, one paddles purposefully, keeping warm, the lapping sounds musical, deep-throated rooks ricocheting their call round rocky bends echoing, bouncing off glassy surfaces, wood-smoky mists rising. Banished is the garish, overly-festooned–any and all too-muchness falling away to let be what simply is….. I KNOW, I KNOW, it’s June. I’m incurably attracted to Autumn and Winter, most likely because they are for me what I’d describe as cozy seasons, where a sweater serves perfectly. ADMITTING to age preferences is slightly embarrassing, but only slightly. Heat is no longer an attraction to me, weather-wise, and here it is June 5 and in two days it will be going to 92F (33C). Now please, do NOT misinterpret this as whining. I’m not (right now), but rather simply stating a preference in order to justify posting this painting…. 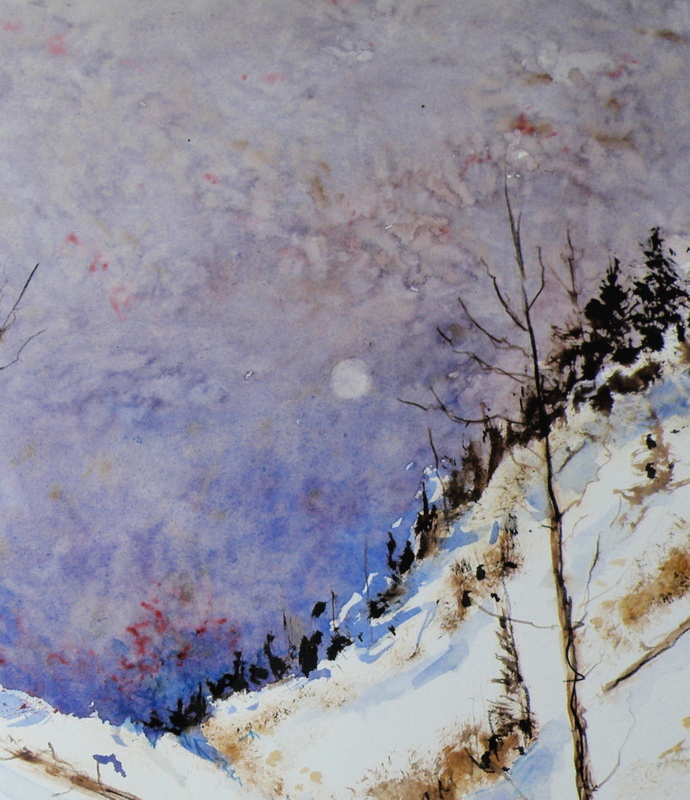 WHEN PAINTING, I admit to finding it more satisfying to express feeling through stark scenes with diminished-light. For one thing, the above place is not one many people would find themselves visiting at that hour in that weather. It therefore brings us in as though inviting a search for Snowy Owls on the prowl, or a pack of Grey Wolves threading a path back to the lair. MY GREATEST CHALLENGE when painting anything is composition. 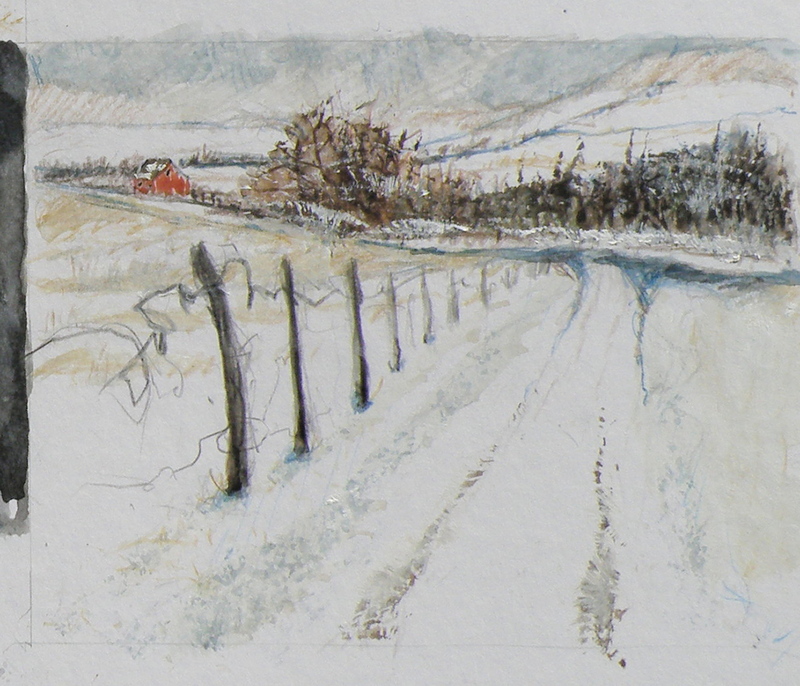 For years I felt I was being a ‘purist’, insisting that I always paint on location, never in a studio setting. And once at the location, I convinced myself that if a tree was in that spot, then that was how it needed to be depicted. IT WAS ALL DUE TO my tendency to early-on stop referring to the subject in front of me and become more and more involved in what was happening on paper, to the point where I may as well have not been on location at all. So in an effort at self-discipline, I decided that not only should I paint what things actually look like, I shouldn’t muck around with how and where ‘mother nature’ placed them. THE SILLY THING WAS, I ended up choosing a composition by default because of course, I couldn’t paint everything my eyes saw in front of me. And more often than not, it was not a good composition. So now, not only do I go to some lengths to study the skill of creating an interesting arrangement, I realise it is the painter’s task to take what ‘mother nature’ provides and make art out of that. Fences do need to be repositioned, as do trees and hills and clouds. SO NOW I MAKE thumbnail studies first on matt board before beginning anything . . . THE OBJECTIVE is to provide a focal point, a visual way in towards it, then additional visual interest so the eye has more to discover by wandering beyond the subject itself. These thumbnails are exploring the use of a compositional figure ‘Z’ shape to lead the eye of the viewer. 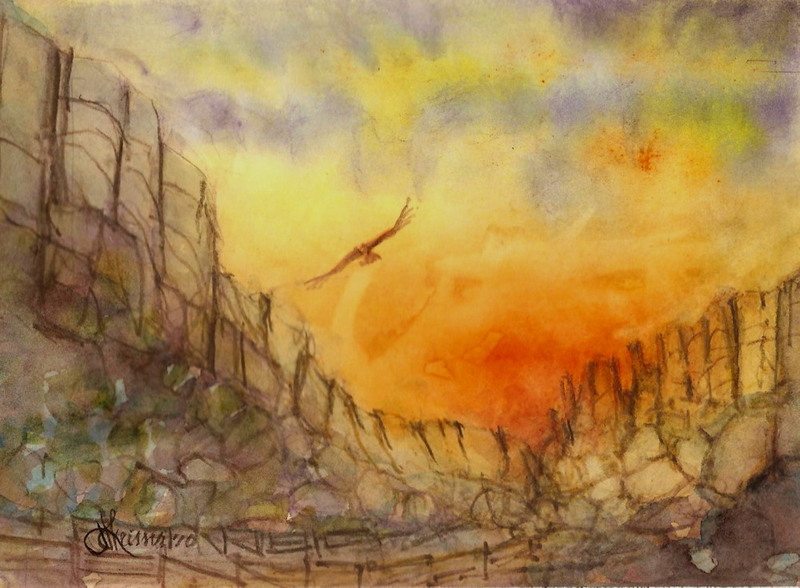 ARTIST TRADING CARDS aka ART CARD EDITIONS AND ORIGINALS are popularly known as ACEOs. ACEOs are the size of baseball cards–65mm x 89mm (2.5″ x 3.5″) and are purchased and then traded and sold the way sports cards are. 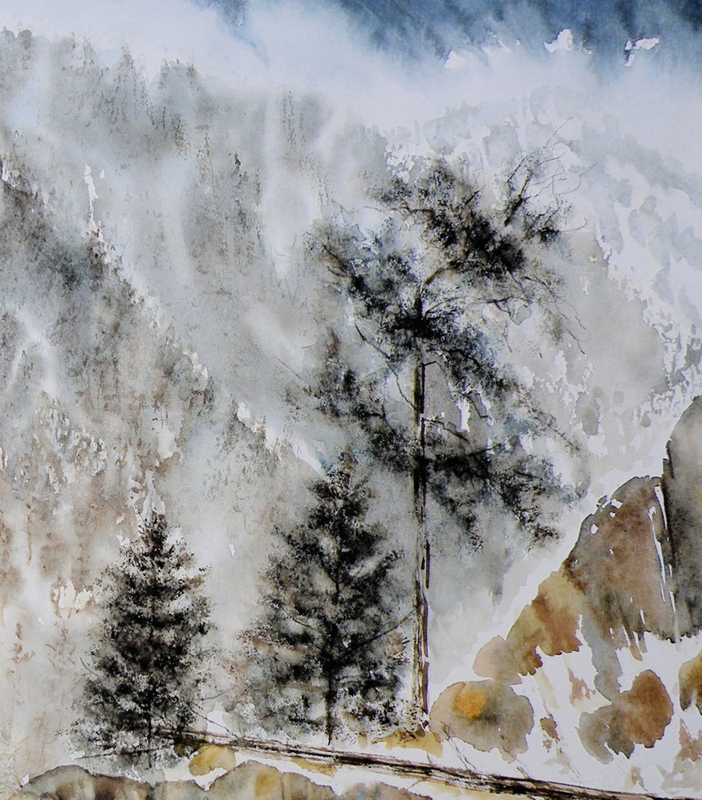 The ACEO movement originated in Switzerland in the 90s but grew in popularity through eBay, where art cards are now sold and bought on a 24hr basis. They require precision and are very enjoyable to do. 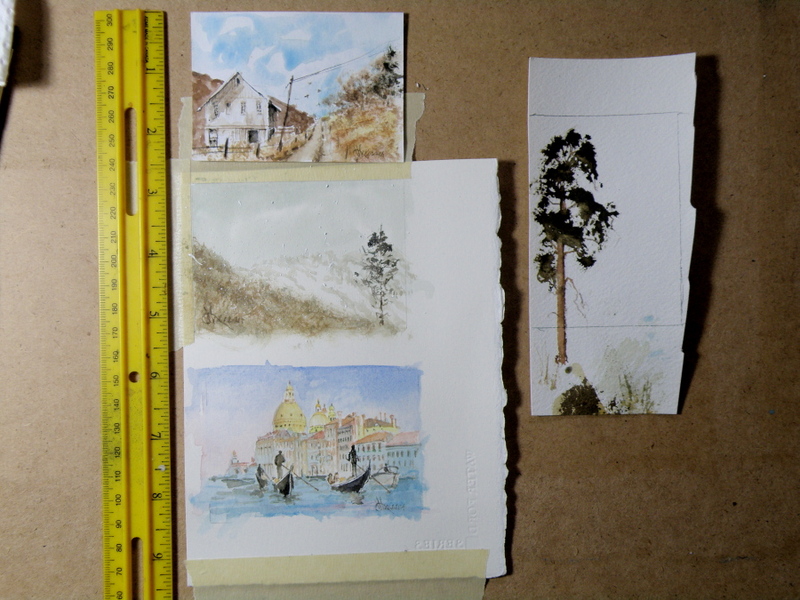 But then, who wouldn’t be fascinated by the challenge of painting tiny things (smile). The subject matter can be chosen by the purchaser, and the painting done accordingly. THIS COMPLETED PAINTING of the mountains in our Kamloops area was in need of cropping in order to strengthen the composition . . . THE PAINTING WAS REDUCED IN SIZE down to this as the completed painting .. . THE CHOPPED OFF parts of cropped work can successfully be made into bookmarks, I’ve found, and then be sold for around $2 ea in our little co-op Gallery (www.kamloopscourthousegallery.ca). Waste not, want not, lol! A decision has to be made as to whether this painting ‘holds up’, composition-wise. It succeeds in conveying the misty atmospheric conditions of winter in the mountains. But the composition is troubling me. The landscape of Kamloops, British Columbia, (native word meaning ‘dividing of waters’–the Thompson River divides mid-city to create the North and South Thompson), varies remarkably. Think of a city at 1132 ft. elevation with homes built in terraced-layers down one mountainside and up another, all finding bottom along the broad Thompson River which attracted the attention of The Hudson Bay Company in 1811. Since then Kamloops has become a train hub, a location for gold prospectors seeking their fortunes, and more recently a centre for the forest industry. It is arid here. Summers are hot and dry, and rain is an event. Winters are cold, windy, with average amounts of snow, and a major spot for skiers and snowboarders at the highest elevations. When I walk the dog at 5 a.m., I always hear owls and sometimes coyotes, and occasionally spot a few deer searching for something in the yards below the mountain ridge we hug up against. I’ve also come across black bear in the car port, and seen the evidence of moose. 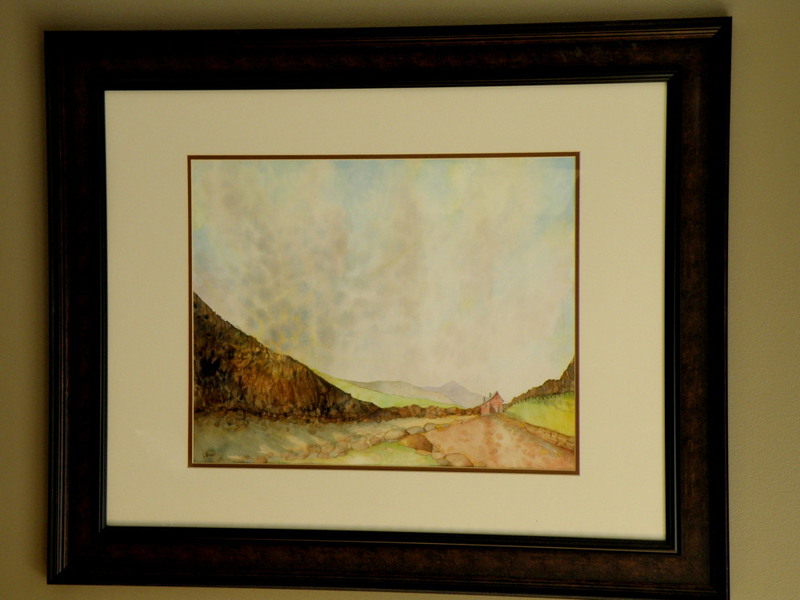 This painting is of what’s locally referred to as The Silt Bluffs. They feature hoodoos, free-standing rock formations caused by wind erosion. The most prevalent raptors in our area are the Red-Tailed Hawk, Golden and Bald Eagles, Osprey, and Turkey Vultures. To look up the face of Mount Peter– (the sibling of the larger Mount Paul), the signature mountains overlooking our city of Kamloops, B. C.–is to look upon the core of a mountain. These are mountains so ancient, all that remains are the inner cores–their souls. Time and erosion have scarred and left them displaying a beauty it takes the eye a while to appreciate. 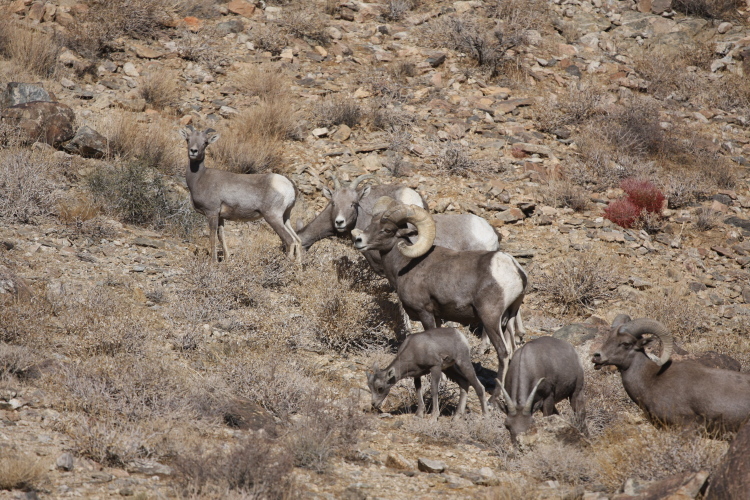 The roads about their base feature yellow diamond warning signs cautioning drivers to watch for Big Horn Sheep. 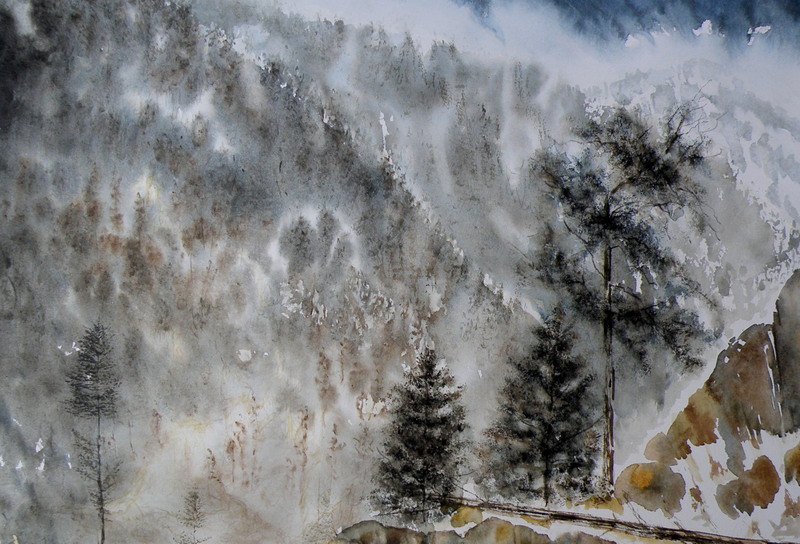 As a watercolourist, it took me a good two years before I attempted the challenge. They are unusual subjects, and not easily rendered. It was wise for me to wait, simply because I was so accustomed to the forested peaks of the Coastal Mountains that I regarded these as ugly. Until they finally become beautiful to the newly-arrived, these ancient and weather worn heights are probably best not attempted at all by art enthusiasts like me. My mother taught one room school in Rosetown, Saskatchewan, in the ’30s. There was such an age difference between herself and her sister that my Aunt ended up being her student. When my mother had no choice but to keep her after school for talking back, that was the beginning of a lifelong distance between them. They got along–don’t get me wrong–but they weren’t ever the best of friends. The notion of a one room school has always been appealing to me, personally. I would have bloomed in such a setting, and benefited from having both older and younger learning their lessons in the same room at the same time–(though probably not if the teacher had been my mother). This painting, entitled ‘Schoolhouse Memories’ is based on a dream I had not long ago, of heading towards a building like this, in a setting like this, on a warm day at dawn, yet never reaching the front door. 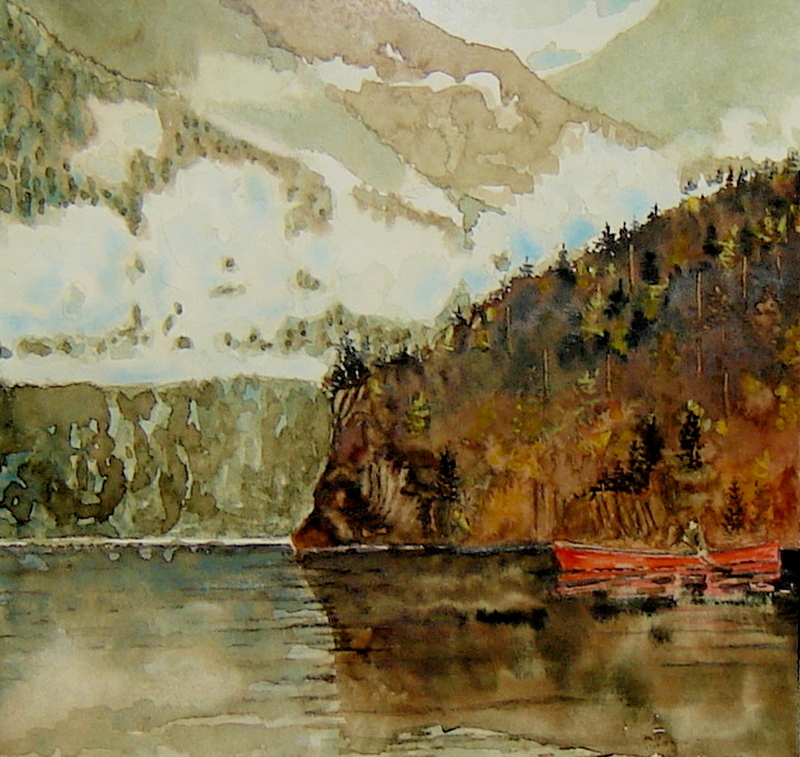 It was in the Federation of Canadian Artists’ Open Show in April of 2010.